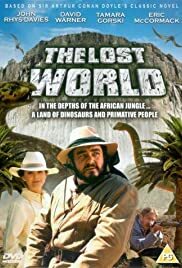 Two rivaling professors, a journalist, a young wealthy woman, and a teenage boy travel through Africa in search of "The Lost World". A place where dinosaurs still roam. An expedition leaves for the Amazon to prove the existence of dinosaurs. A scientist discovers dinosaurs on a remote plateau in Mongolia. A group of unlikely allies are assembled to go on an expedition deep within the Amazon forest in search of new discoveries. The adventures of a band of explorers stranded in a mysterious land inhabited by dinosaurs and other dangers. The first film adaptation of Sir Arthur Conan Doyle's classic novel about a land where prehistoric creatures still roam. An earthquake reaching a 10.5 magnitude on the Richter scale, strikes the west coast of the U.S. and Canada. A large portion of land falls into the ocean, and the situation is worsened by aftershocks and tsunami. Arthur Conan Doyle's "Lost World" performed live as a filmed audio drama. John Rhys-Davies and David Warner play our dueling professors Challenger and Summerlee in this remake of The Lost World. Unlike the 1962 version that starred Claude Rains and Richard Haydn this one is set in Arthur Conan Doyle's own time of Edwardian England and not updated. Professor Challenger says he's been to a prehistoric Lost World in East Africa and his rival Summerlee disputes him. So Summerlee goes along on this second expedition and they are accompanied by photographer Tamara Gaski and young Darren Peter Mercer just about hitting puberty. Why he was along God only knows though he proves useful getting in and out of tight places. The dinosaurs are indeed there including some suspicious natives who worship the beasts when the carnivores aren't eating them. Native girl Nathania Stanford also proves useful in a part Dorothy Lamour would have done decades ago. Sadly this Lost World and its sequel came along around the time of Jurassic Park and the special effects are really cheap and not so special. Still the dialog with Rhys-Davies and Warner makes this one somewhat enjoyable.